Due to a bit of a lie-in on my first day off I didn’t leave home as early as I probably should have, considering the length of the walk I had planned. Fortunately there are plenty of daylight hours at this time of year, so my late start at 11:10 from the car park at Aberarder wasn’t really a problem. I was disappointed to see low clouds covering the ridge leading to Stob Poite Coire Ardair, but I was hoping they would have lifted by the time I got there. 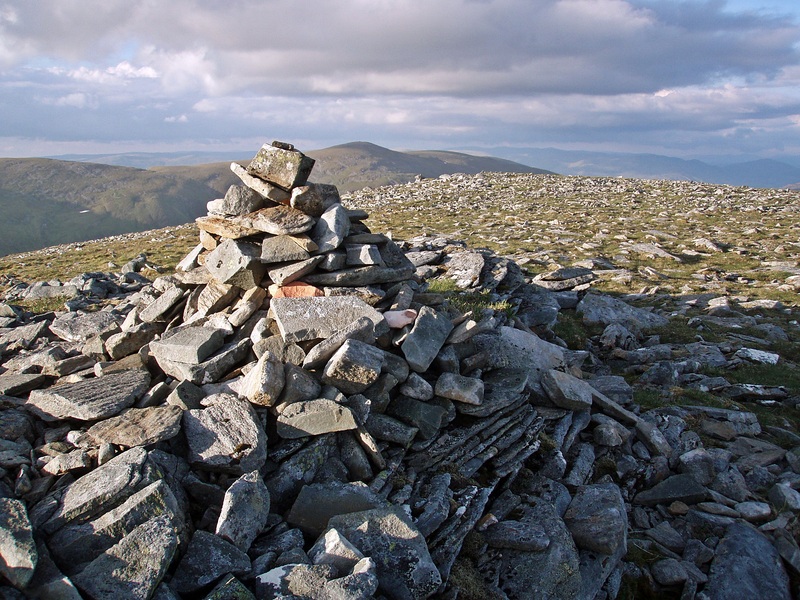 I followed the main path up the glen, but soon left it at a small cairn. 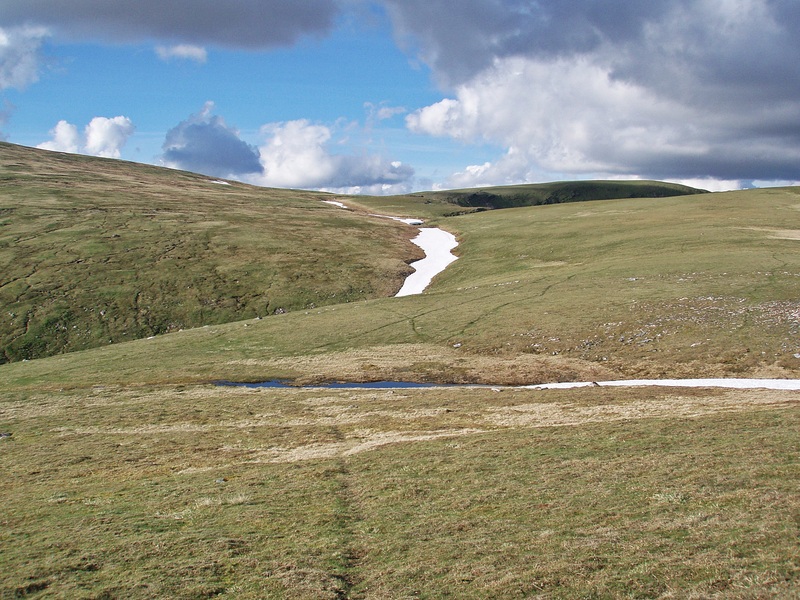 A rather boggy path leads from here first through the forest and later up the open hillside towards Na Cnapanan. 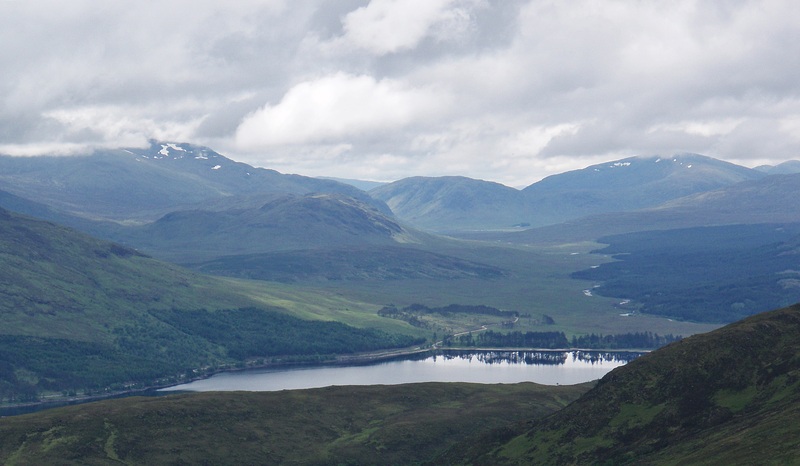 Looking back to Loch Laggan. 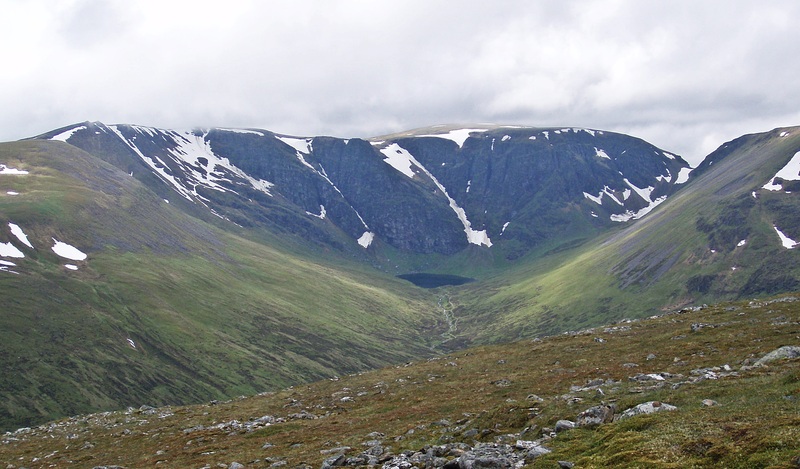 On my way up the clouds had actually lifted and I could now see Coire Ardair and the summit area of Creag Meagaidh. In spite of the overcast weather it had been very warm until now and I had been walking in a T-Shirt. 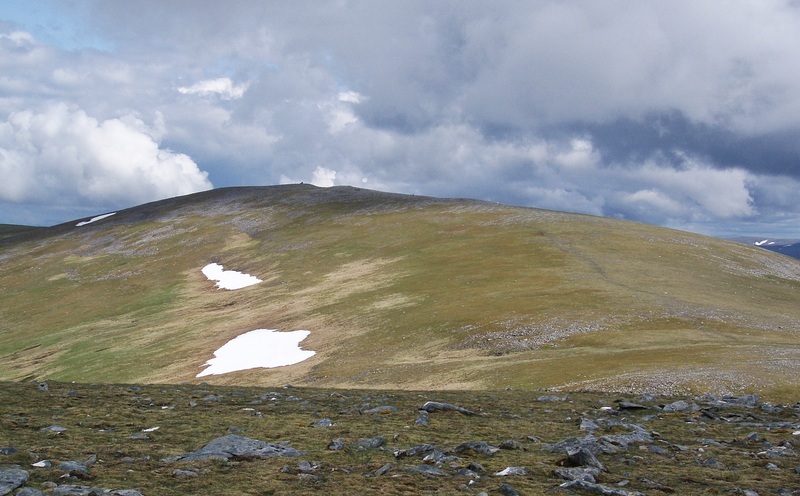 When I reached the rocky summit of Carn Liath, the wind suddenly picked up, it became quite cold and a thick grey cloud threatened to envelop the summit area. 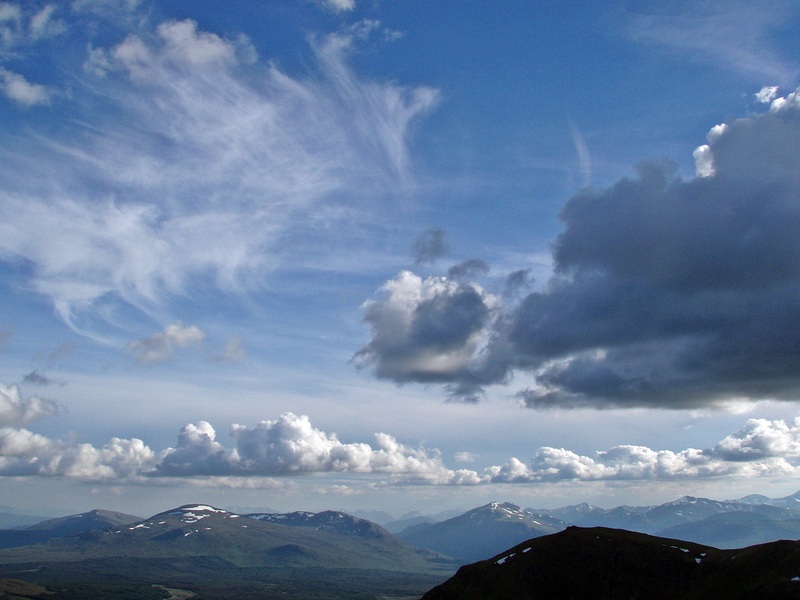 I put my jacket on and continued to the first Munro Top, Stob Coire Dubh. 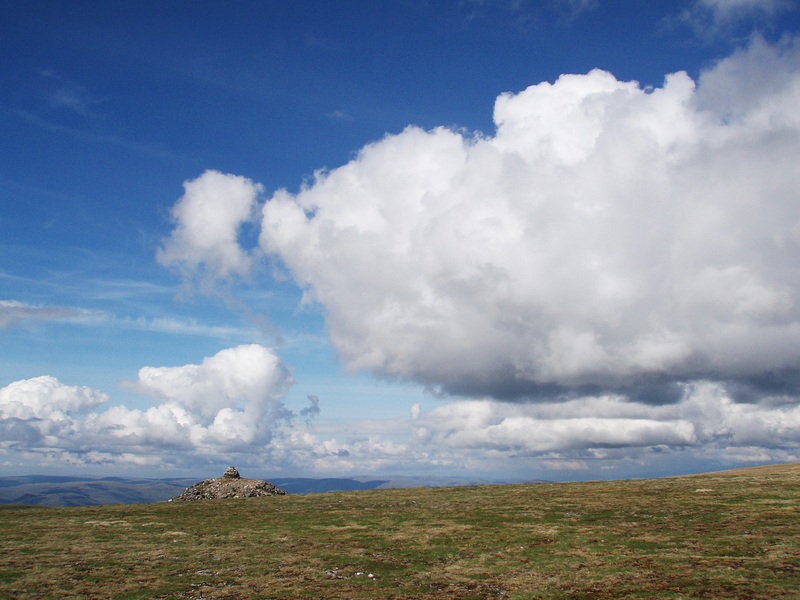 When I turned around the clouds had covered the summit of Carn Liath, but thankfully they dispersed again shortly afterwards. 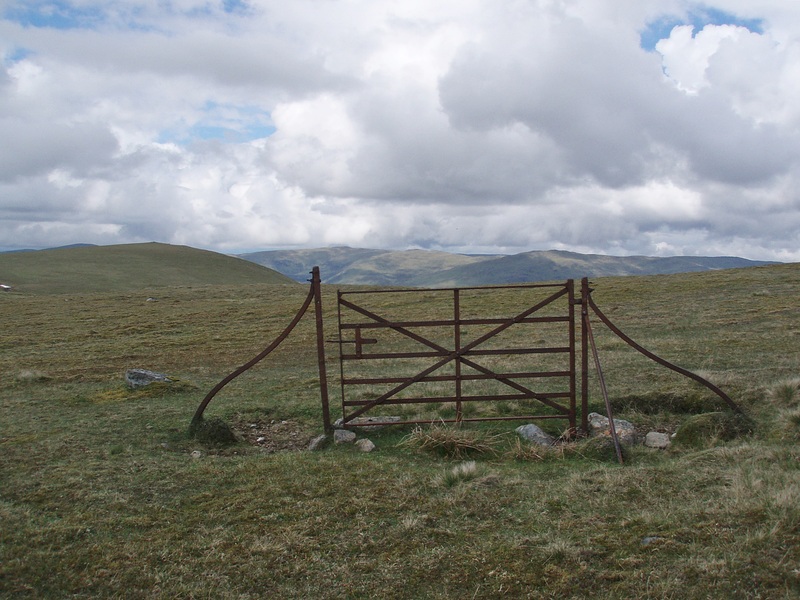 Disused gate on the way to Stob Coire Dubh. Sandy beach at the E end of Loch Laggan. 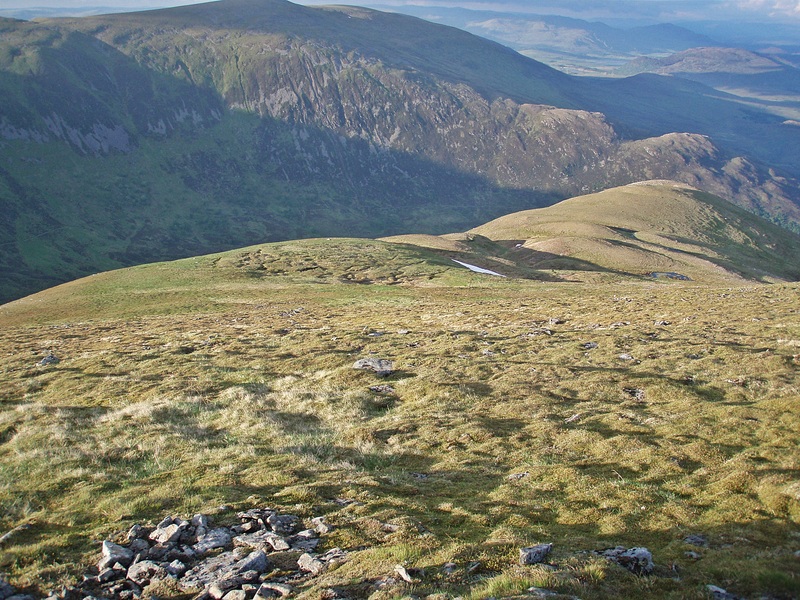 View towards the Corrieyairack Pass – the tiny white dot is Melgarve Bothy. 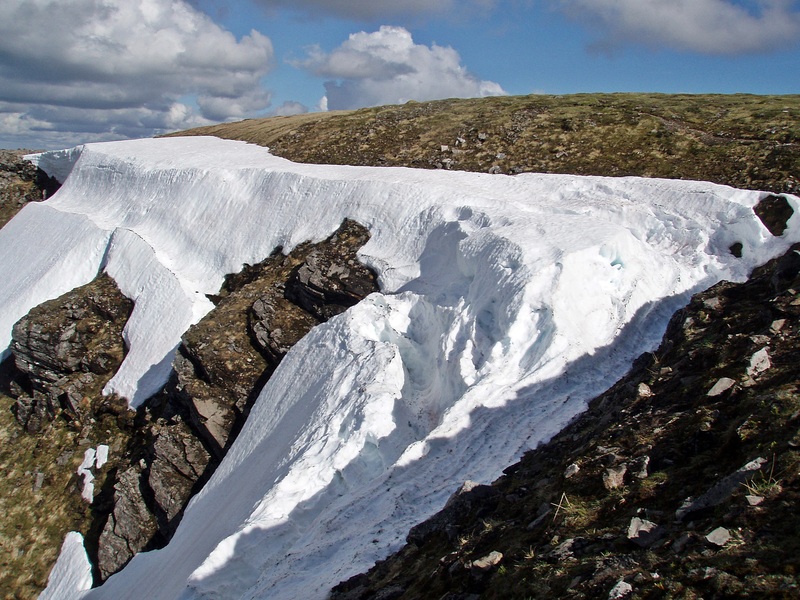 To avoid traversing the stony summit area of Carn Liath a second time I contoured around it on its N flank, passing below a large snow field. 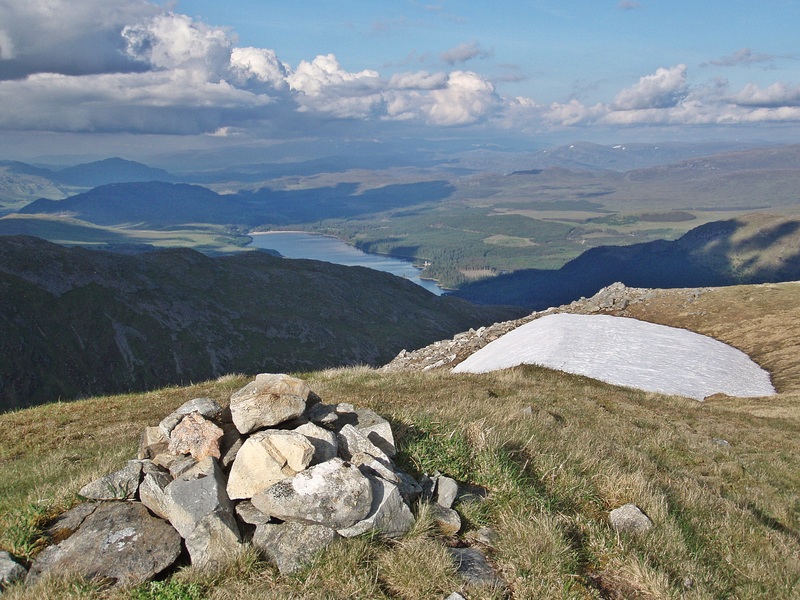 The second Munro Top, Meall an t-Snaim. 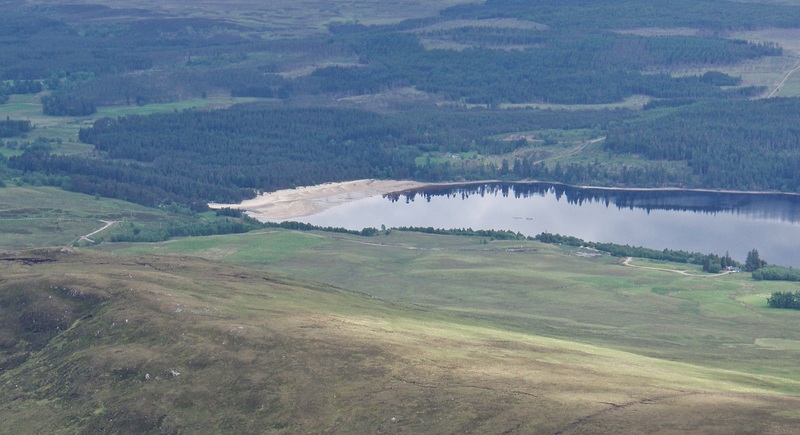 Loch Spey and Loch a’ Bhànain. 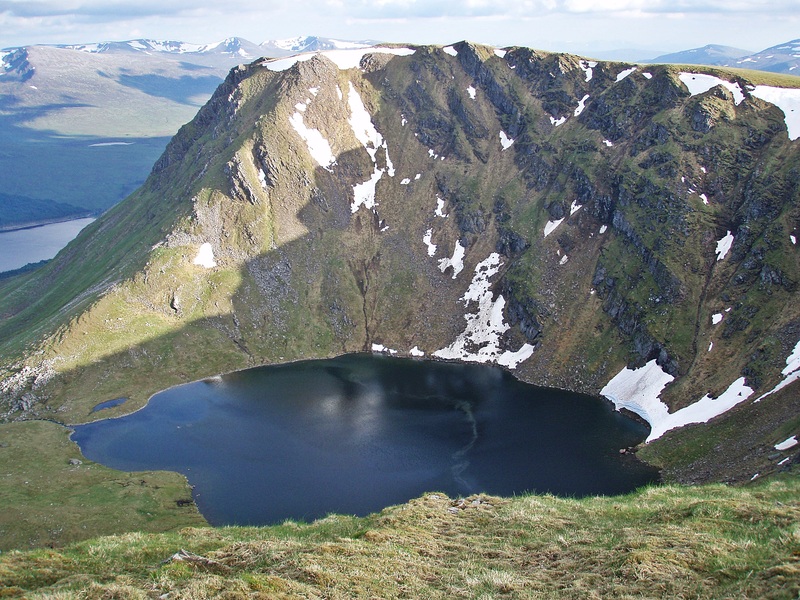 Coire Ardair with Lochan a’ Choire. 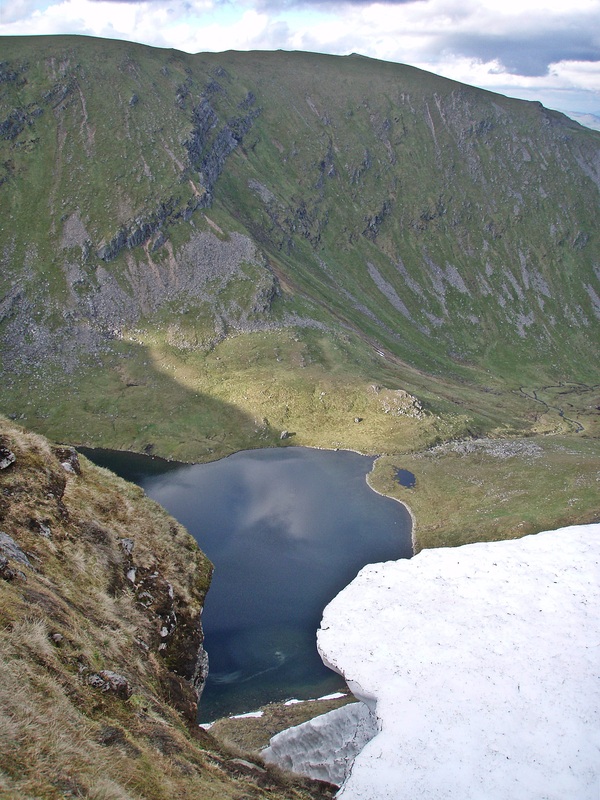 The next Top, Sròn Coire a’ Chriochairein, is only a short distance away. 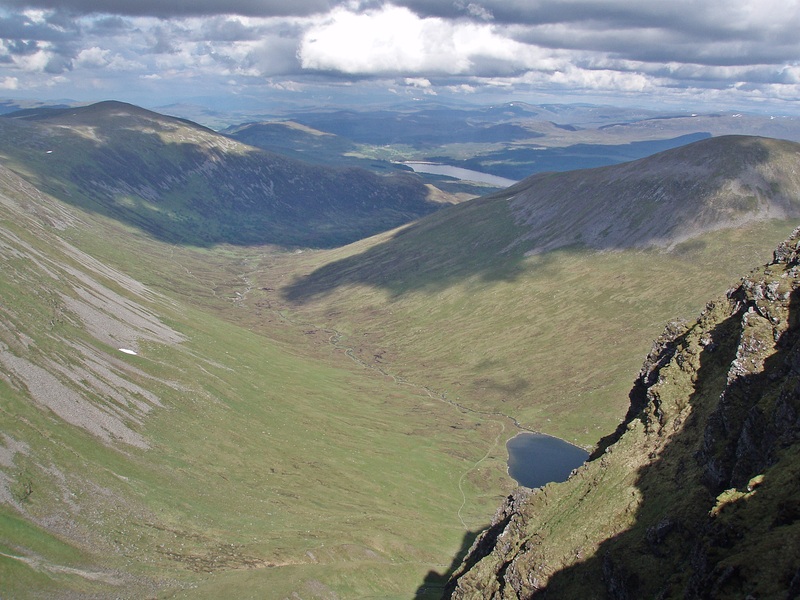 From here I could study my planned descent route from Sròn a’ Ghoire later in the day. 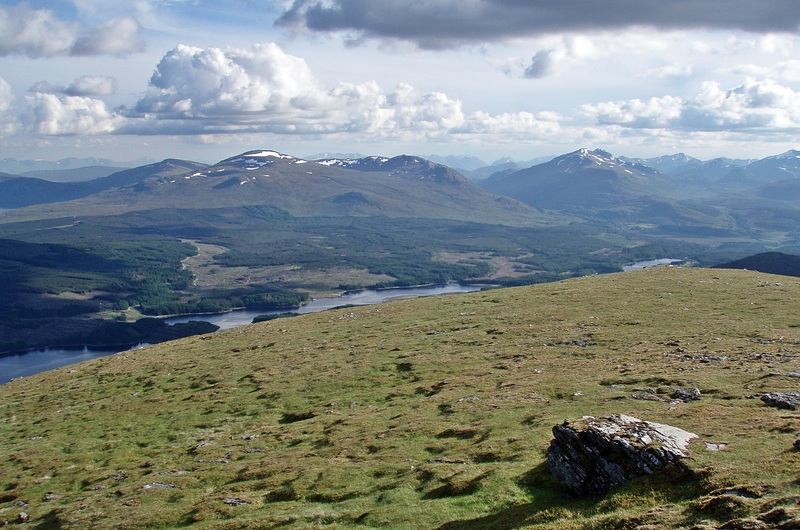 View along the glen towards Loch Laggan. 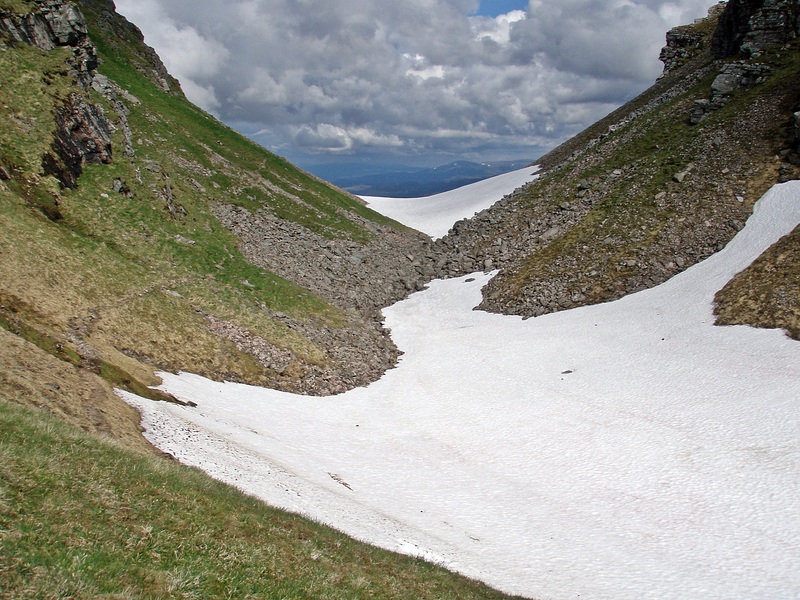 Some of the gullies still held the remains of large snow patches. 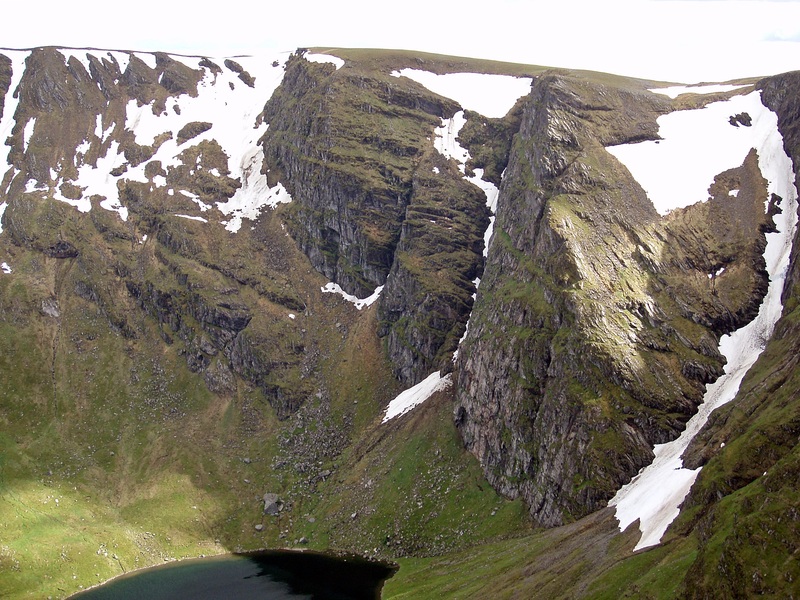 Steep crags of Coire Ardair. 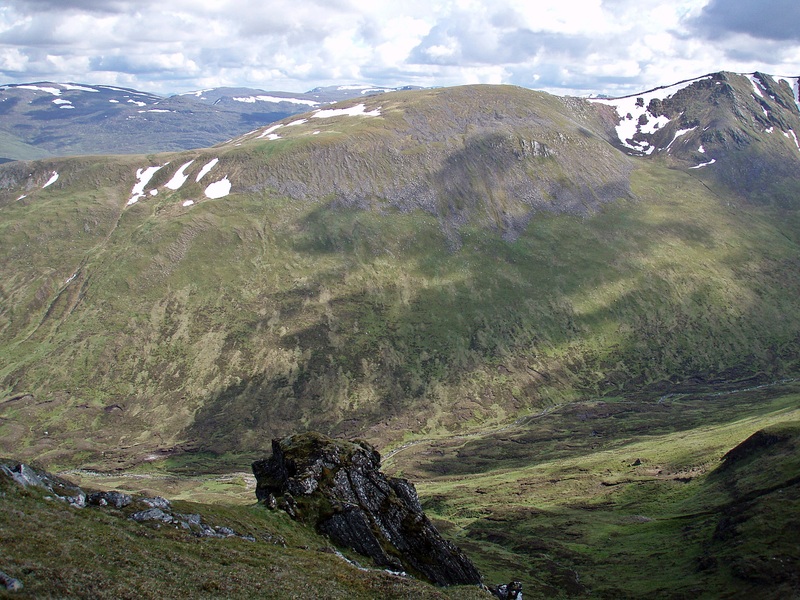 View across The Window to Creag Meagaidh’s summit plateau, with Mad Meg’s Cairn just visible in the centre. 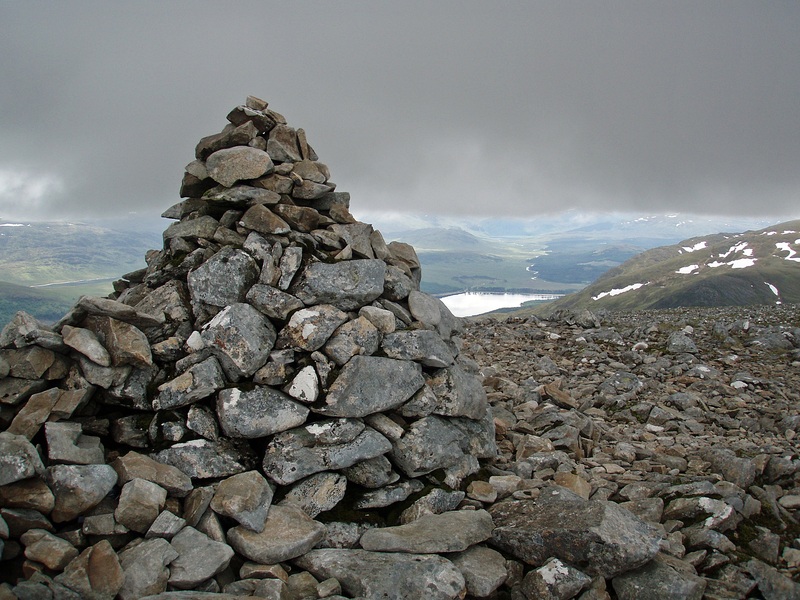 Stob Poite Coire Ardair summit cairn. In the meantime I had almost run out of water and was glad to see several streams below that didn’t require much of a detour. 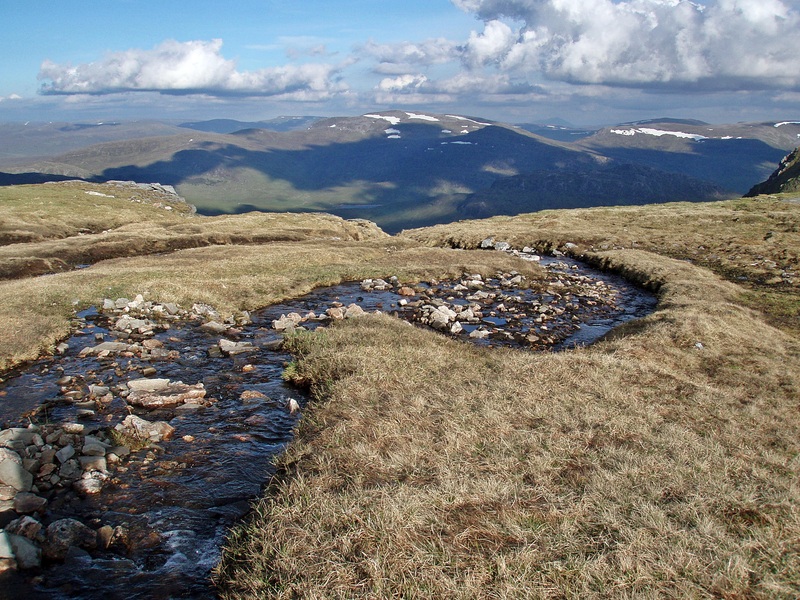 I descended to The Window and walked W until I reached the first fast flowing stream and sat beside it for a long break in the sun, and to fill my water bottle. 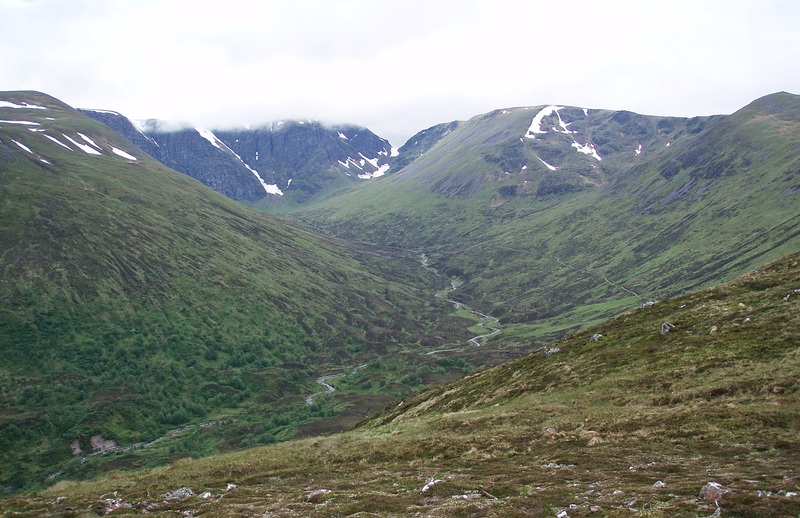 From The Window it is only a short climb up to Creag Meagaidh’s summit plateau, and I first made a quick detour to the eastern edge of it to look down into the glen of the Allt Coire Ardair. 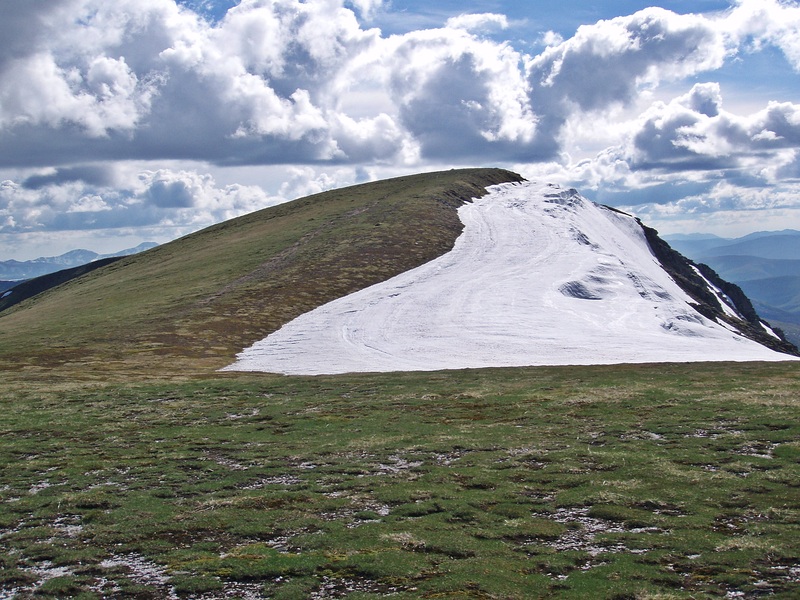 Cornice at the edge of the plateau. 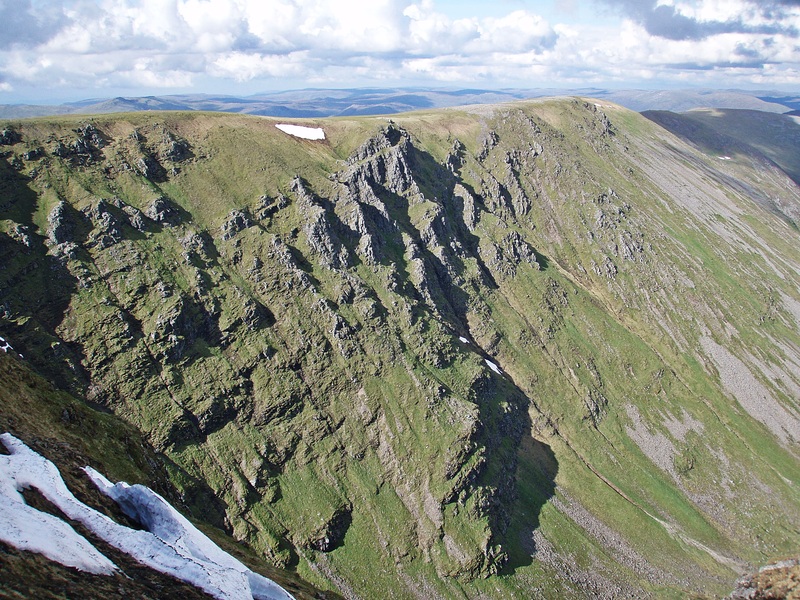 Crags below Stob Poite Coire Ardair. Huge cornice on the way to the summit. 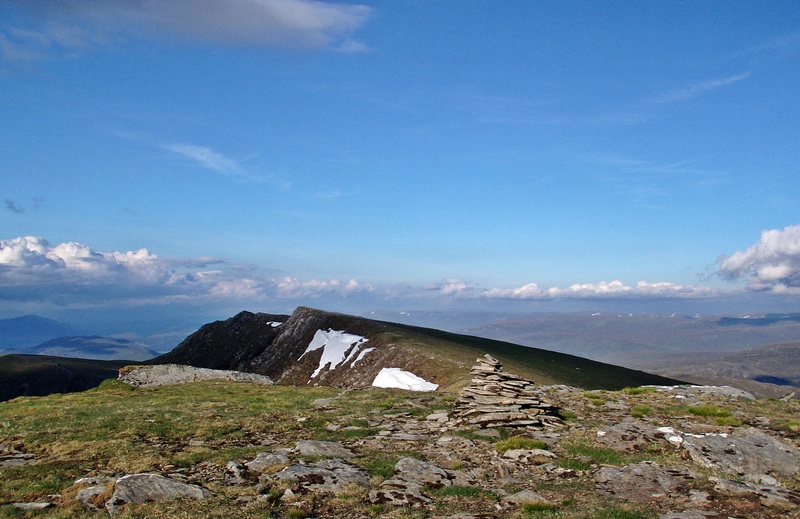 View SW to the neighbouring Munro Beinn a’ Chaorainn. 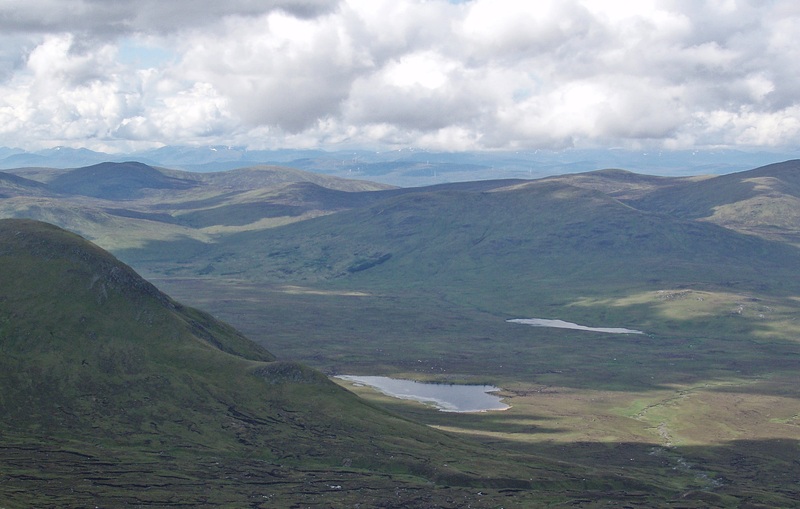 From the summit I contoured around Moy Corrie towards the Munro Top An Cearcallach. 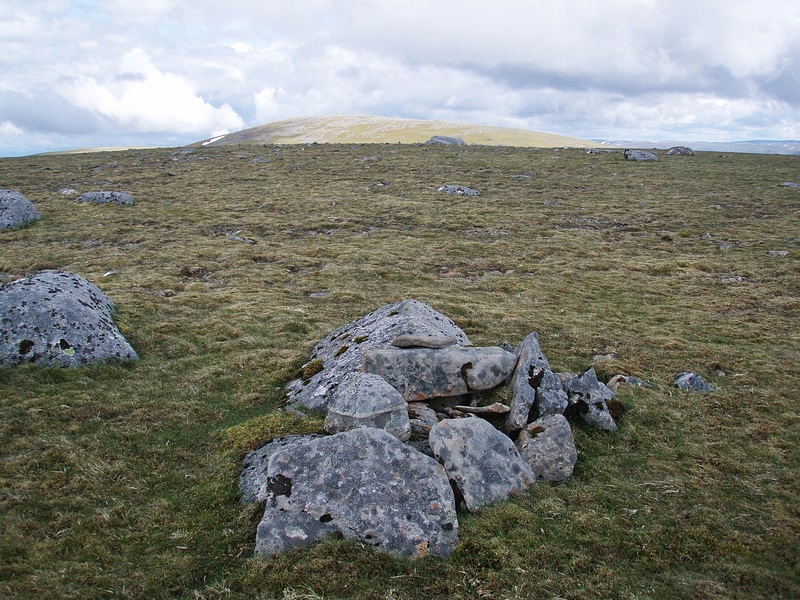 Throughout the walk I kept thinking that the whole summit area of this Munro looks like a perfect campsite – level terrain covered with short, dry grass, and only very few damp areas like the one in the photo. 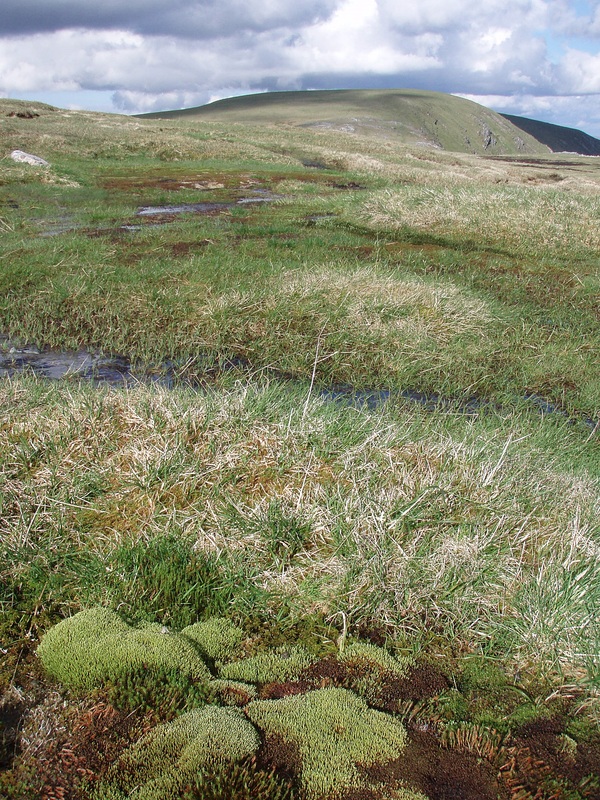 There is also a good water supply, the headwaters of the Moy Burn. 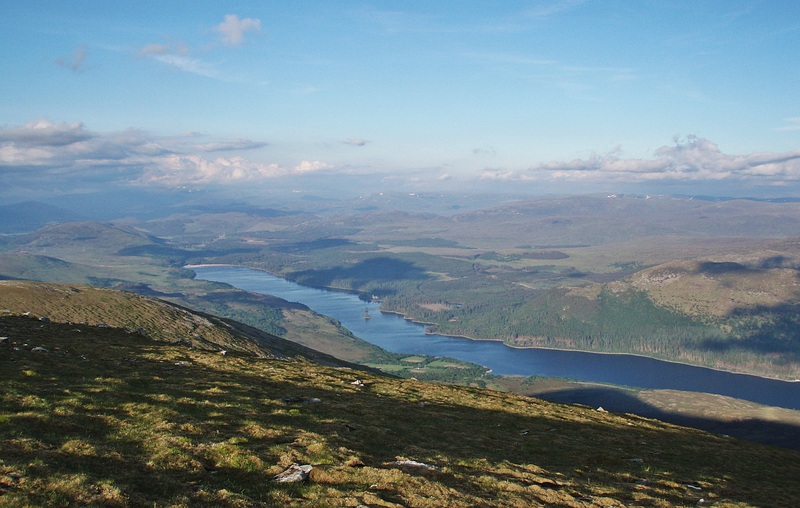 View across the W end of Loch Laggan and the Munros Beinn a’ Chlachair, Geal-Chàrn, Aonach Beag and Beinn Eibhinn. 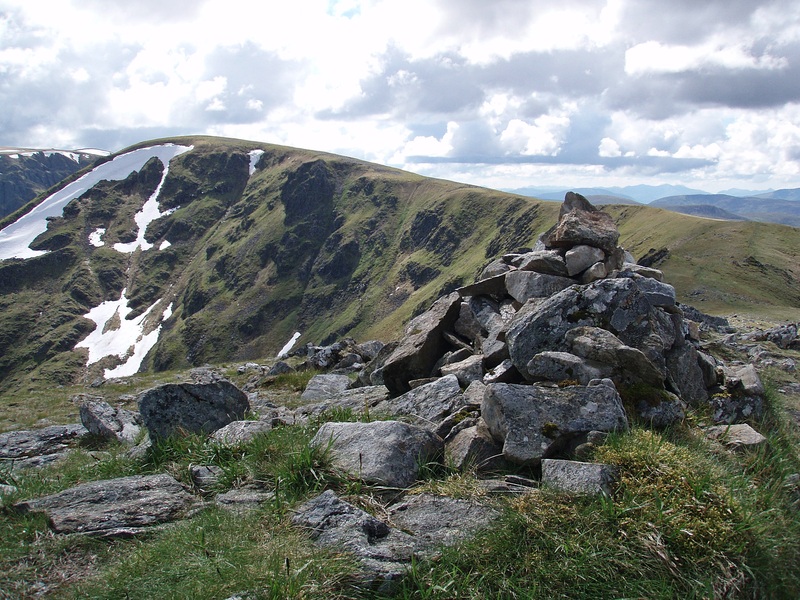 Shortly before I reached the summit I had an amazing encounter: In the distance I saw a figure crouched down on a rocky outcrop, and by the size of it I thought at first that it was a fellow walker settled down for a break. But something about its movements didn’t feel right, and I realised this wasn’t a human being. 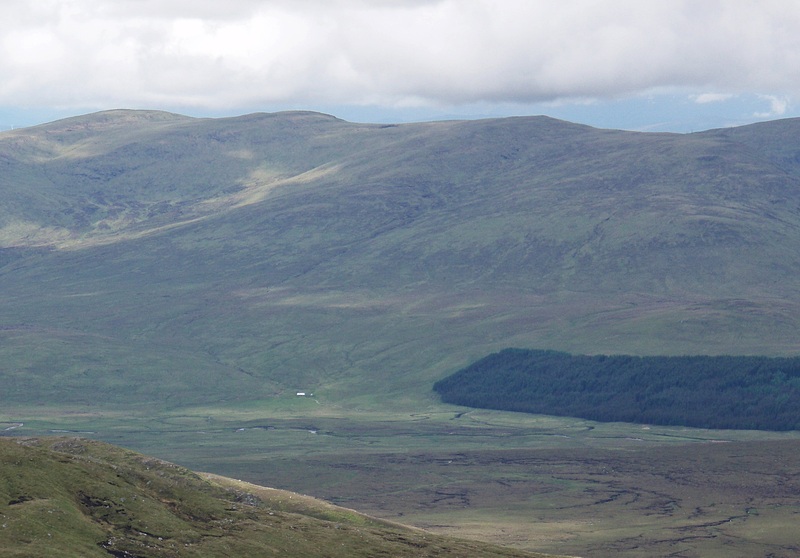 Still thrilled by this encounter I continued to the summit of An Cearcallach. 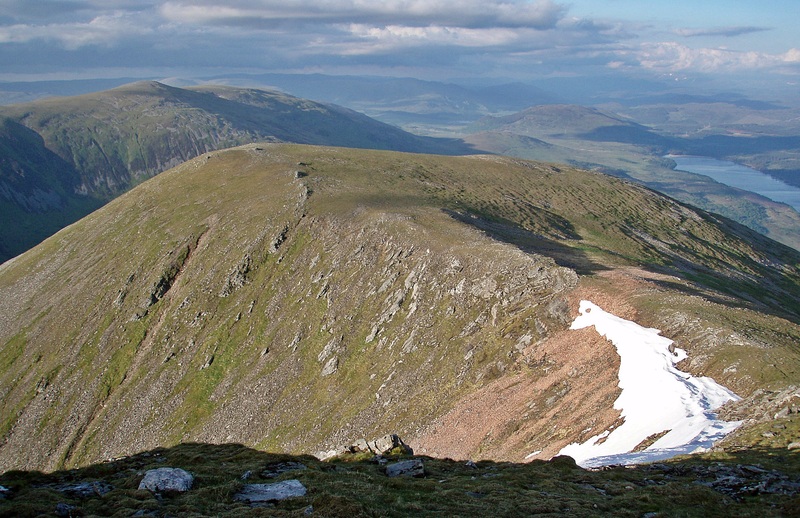 Chno Dearg and Stob Coire Sgrìodain. 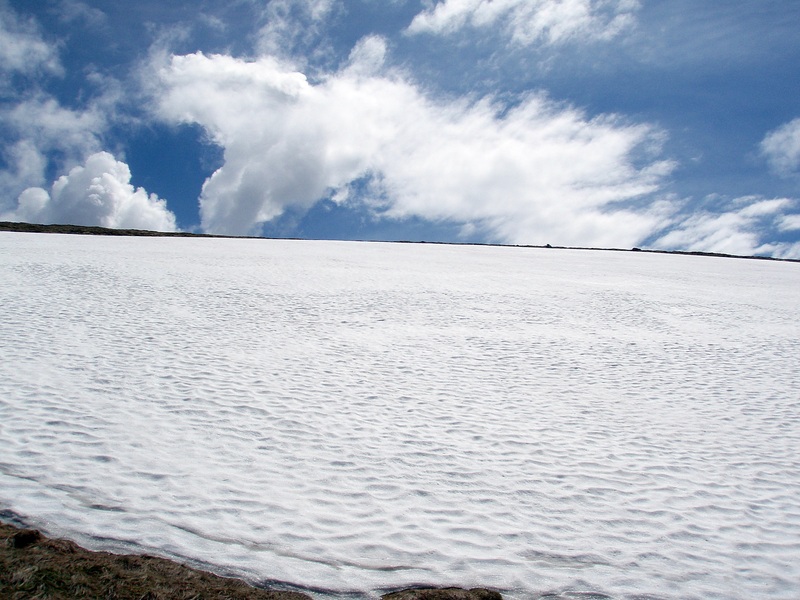 I made my way back across the vast plateau towards the next Top, Meall Coire Choille-rais. 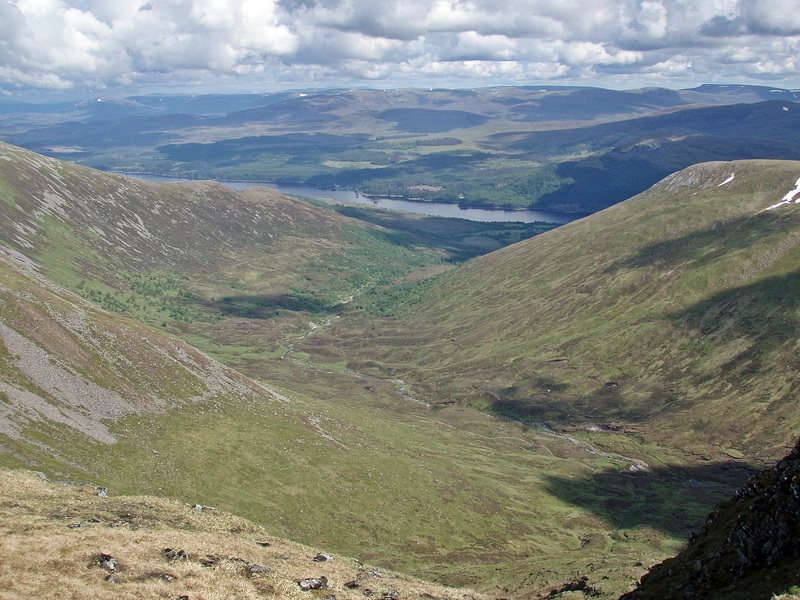 View along Loch Laggan from the summit of Meall Coire Choille-rais. 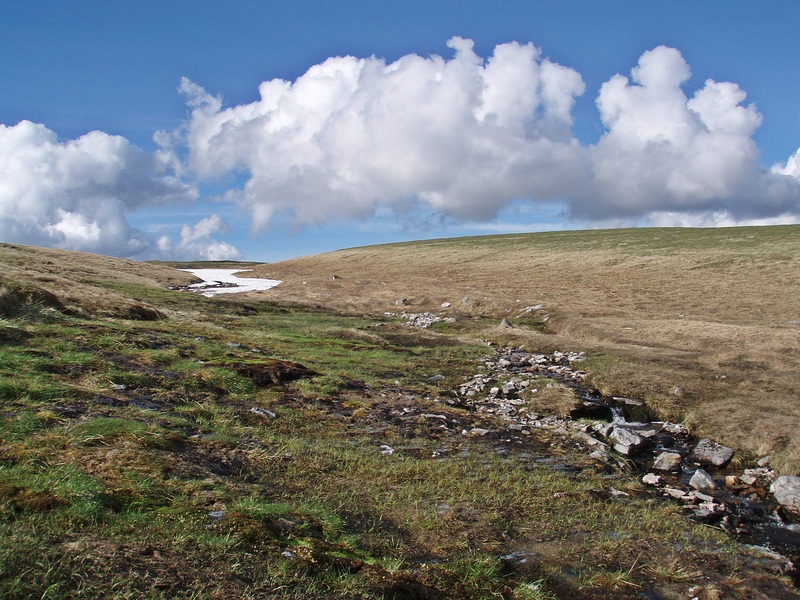 On my way to the next top I crossed the headwaters of the Moy Burn again and was surprised to find such a substantial watercourse at a height of 1000 metres. 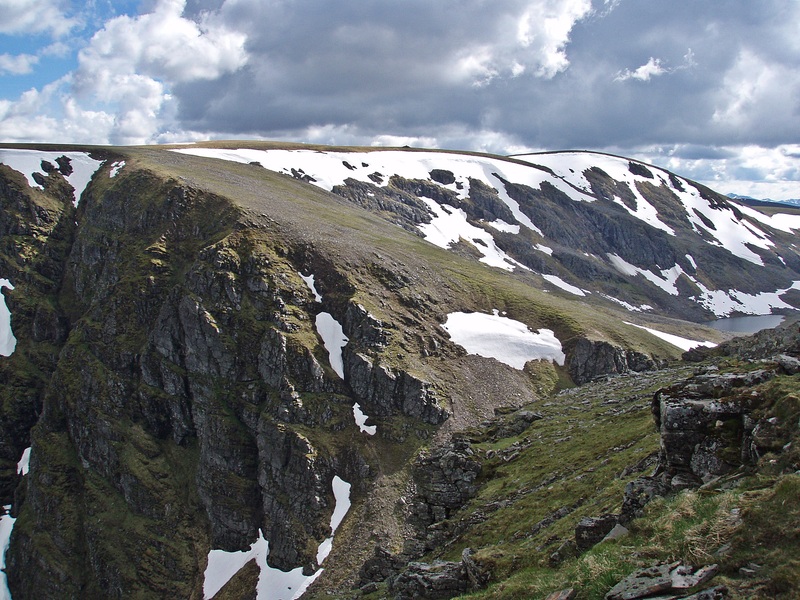 Looking back to Meall Coire Choille-rais. 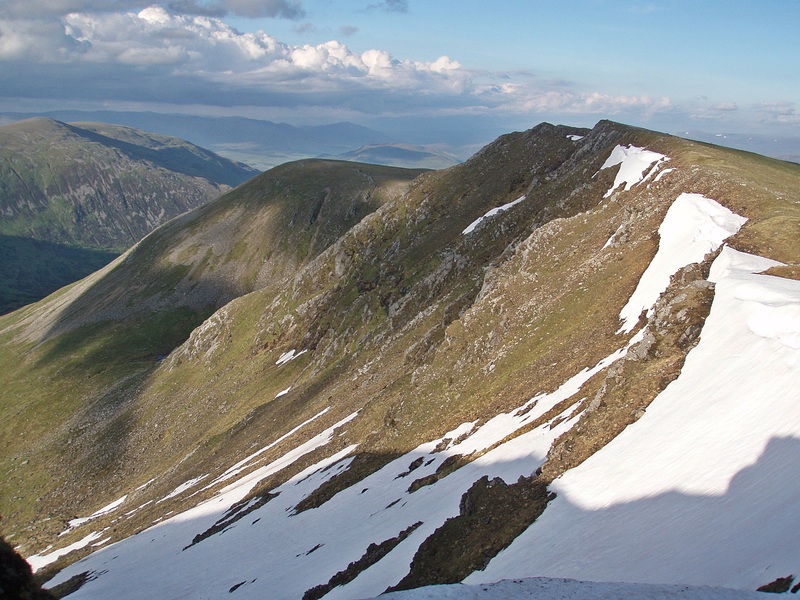 The next Munro Top Puist Coire Ardair. 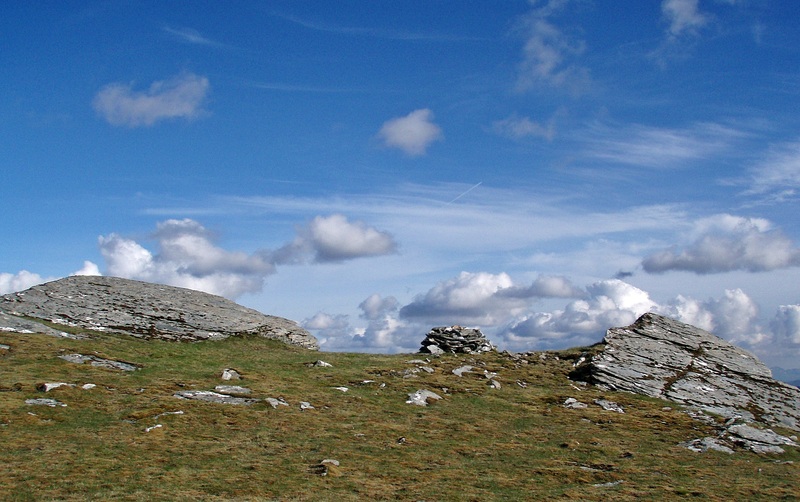 Approaching the last Top, Sròn a’ Ghoire. 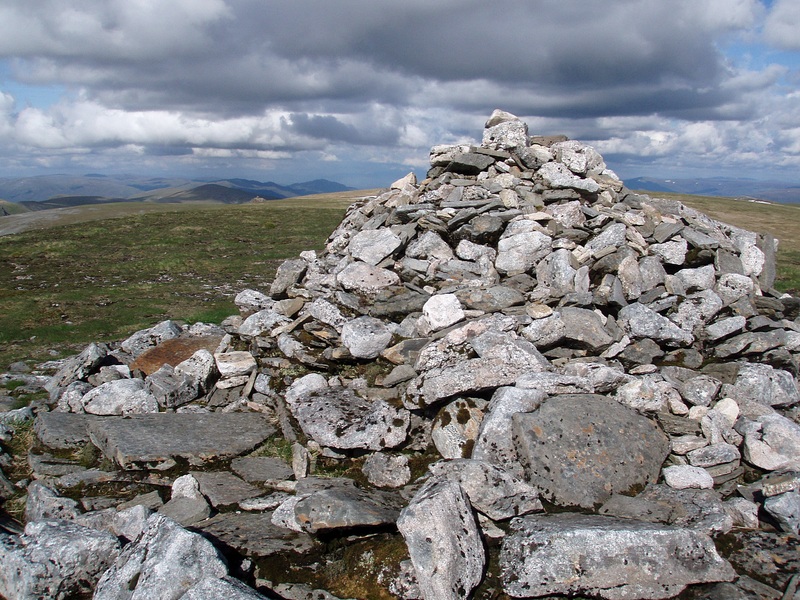 Sròn a’ Ghoire summit cairn. 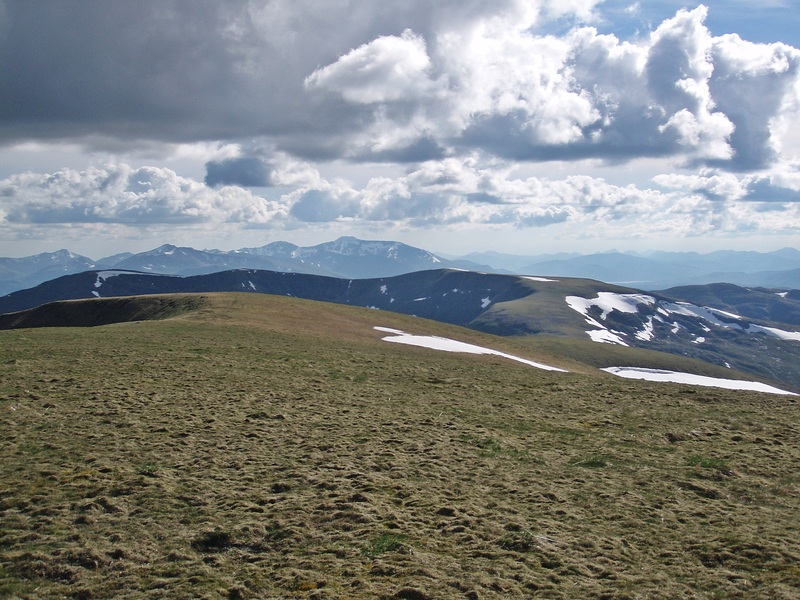 From the last summit I followed the grassy wide ridge for a few hundred metres to avoid the steep slopes on its N side. 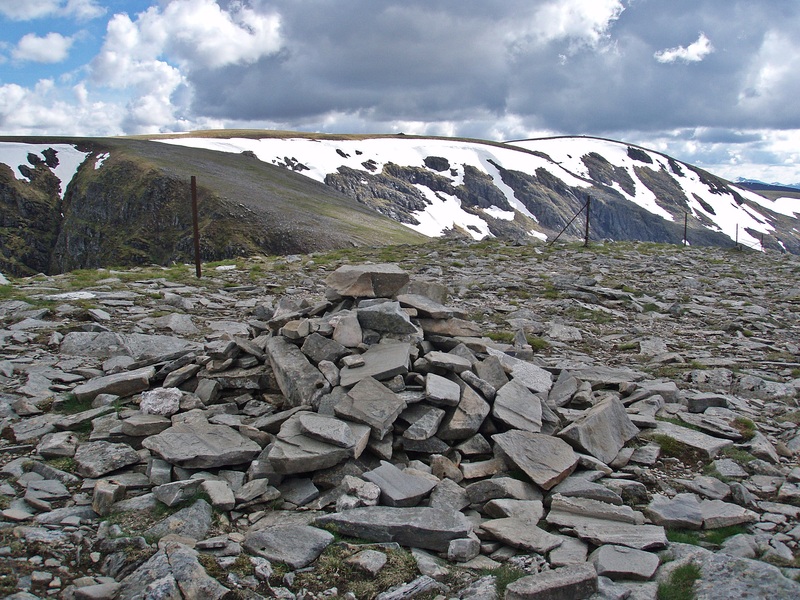 Then I descended to the Allt Coire Ardair and managed to ford it with dry feet, using some stepping stones. 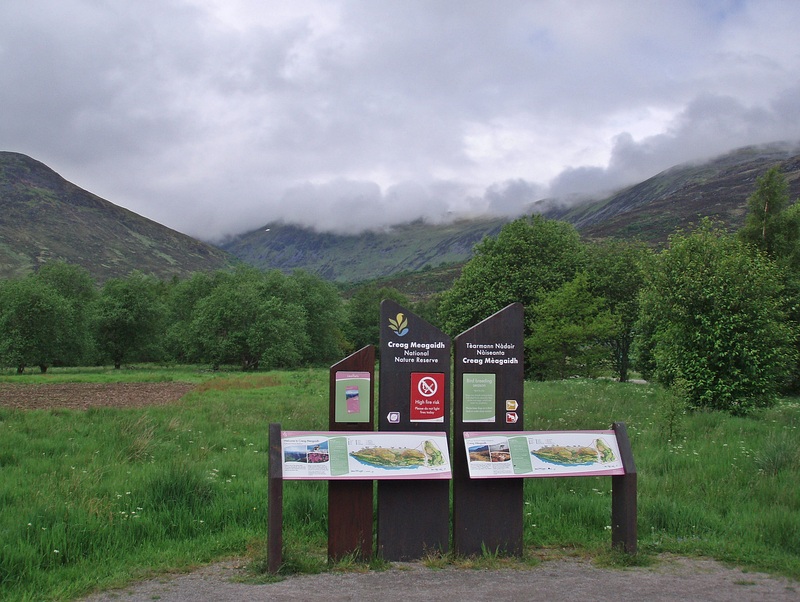 After that it was easy going on the excellent path along the glen. 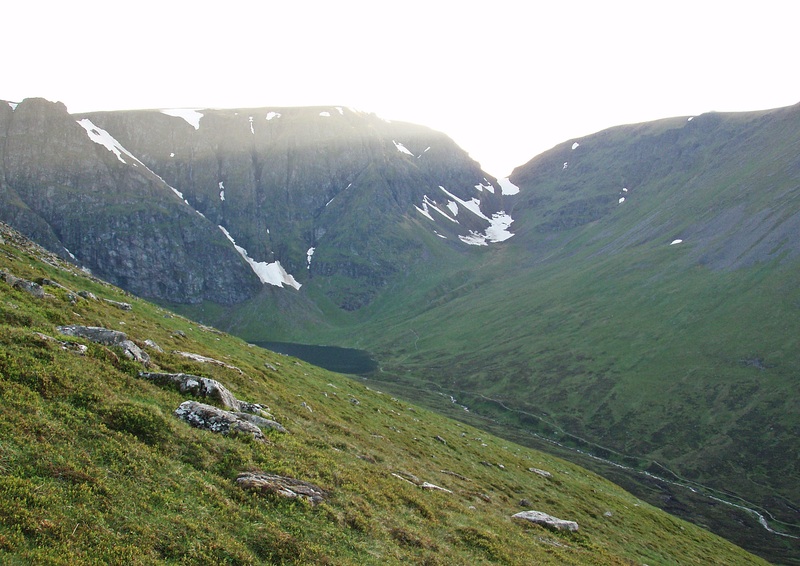 As the daylight was fading quickly I was treated to some lovely colour effects on the Ardverikie hills opposite. 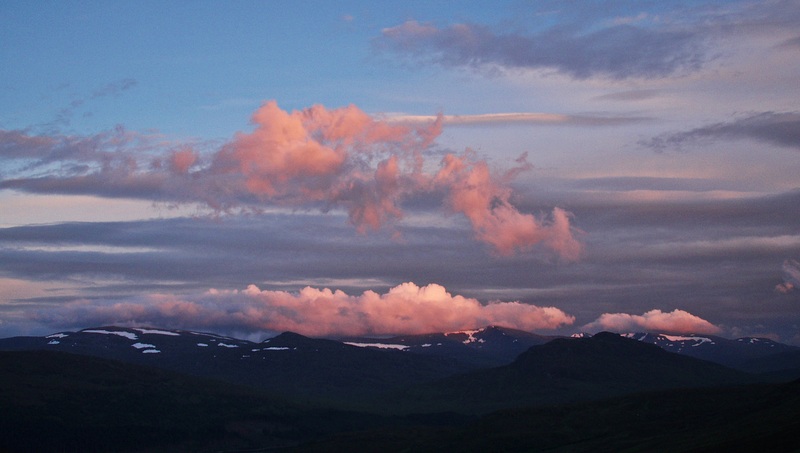 Pink clouds in the evening sky. When I arrived back at the carpark at 22:30 it was almost dark. 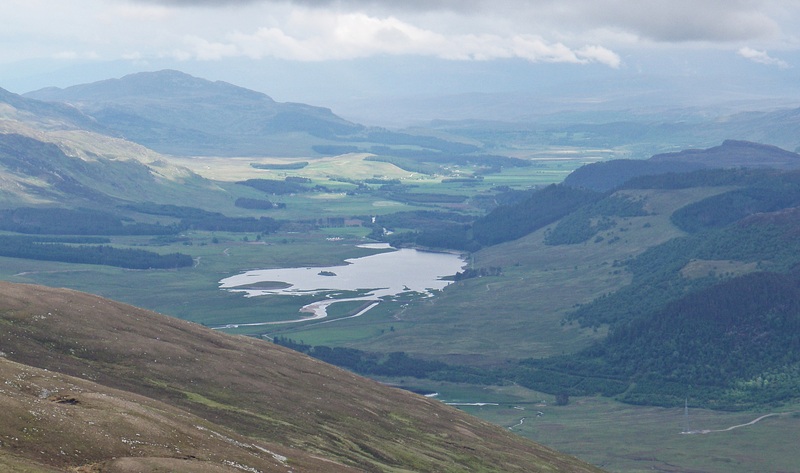 It had been a long but very rewarding day, with the sighting of the Golden Eagle being the highlight of the day. That looked a really good day out and a fine circuit! 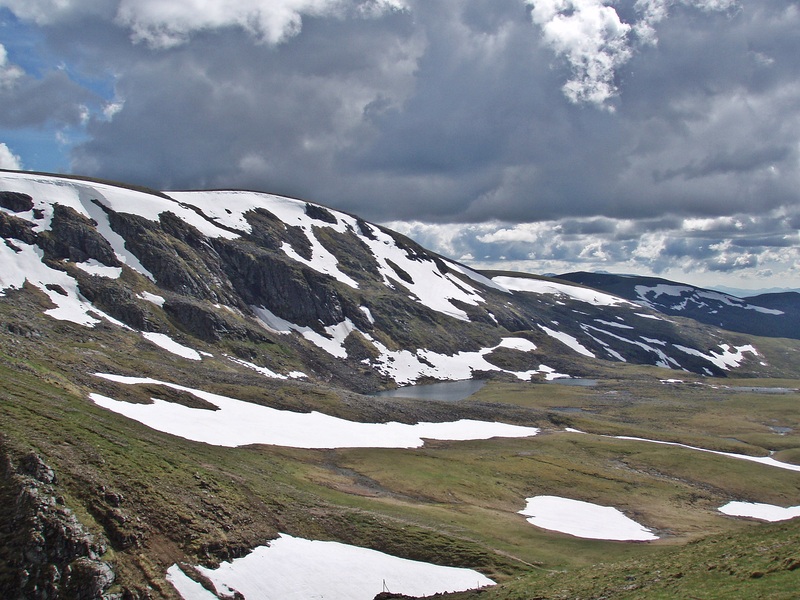 Lovely light in the photos (I did the Creag Megaidh hills on a very hazy autumn day) and nice to see that the remnants of winter were still holding on into June. 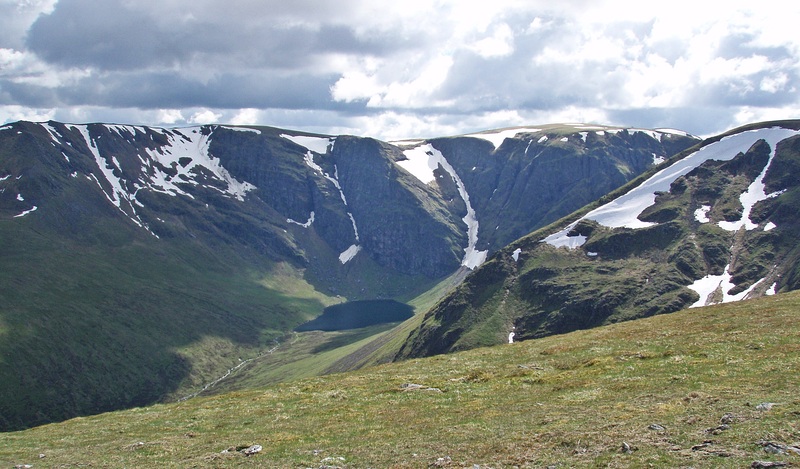 I’m already dreaming of long days and walking late into the evening – that area around the Moy Burn looks great for a high camp too. A superb high level route. 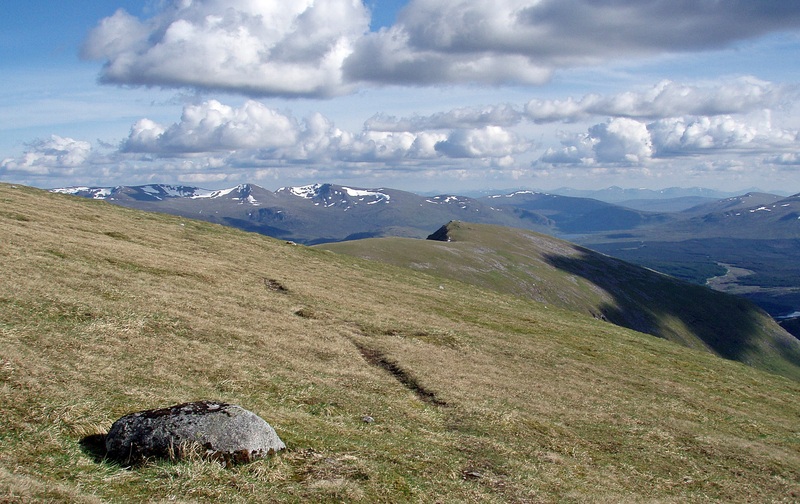 Its a fair old circuit linking just the Munros so including the tops must been taken quite some extra effort. 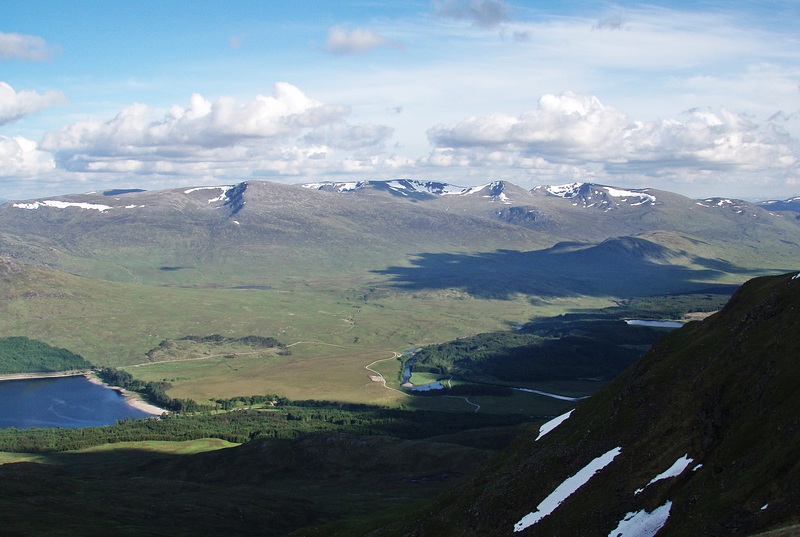 Some brilliant photos highlight what must have been a fine day and to have it topped off with a close encounter with a golden eagle must been the icing on the cake..
It’s a great route and taking in the Tops gives some good views beyond the large plateau. It was definitely worth the effort! 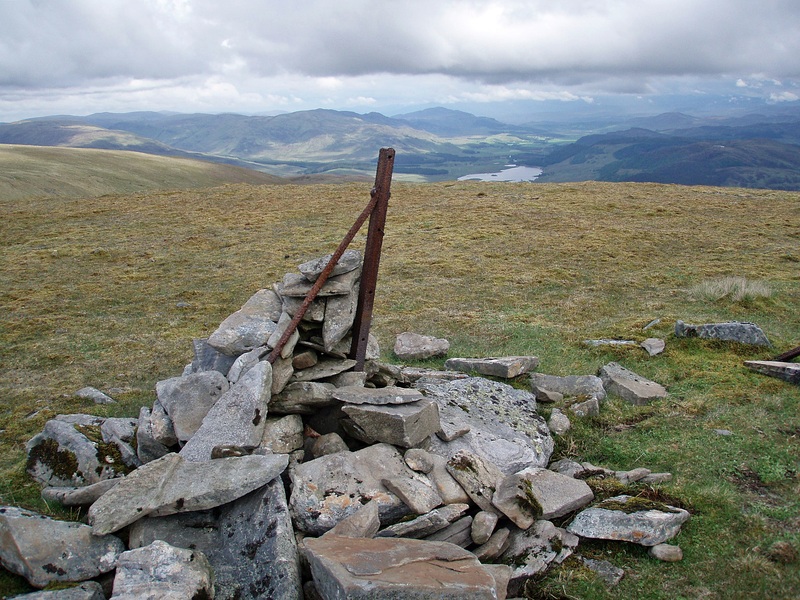 Great photos and it is on my TGOC 2015 route. Looking forward to going up there. 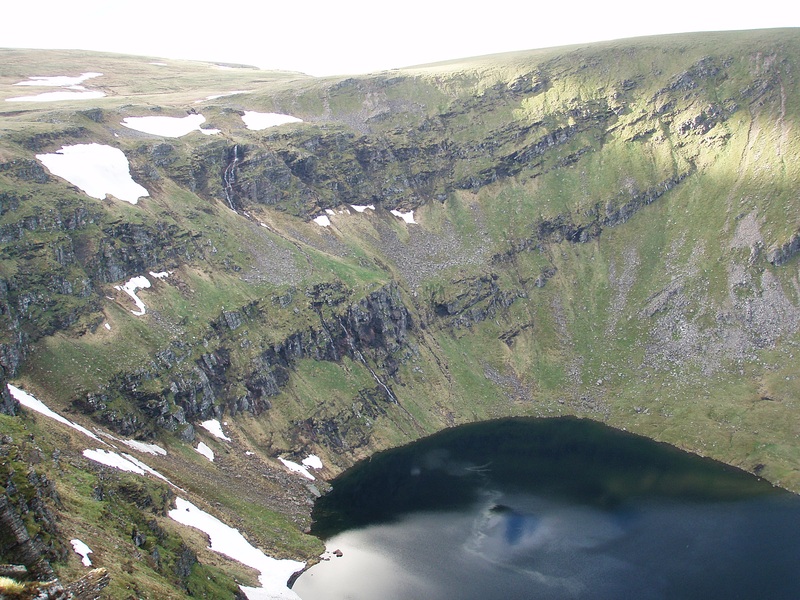 Nick needs to get that camp in before May as we are aiming to camp up there and will nip him to the post on it, and I had wondered about water on the area by the Moy and that question is answered. Thanks. 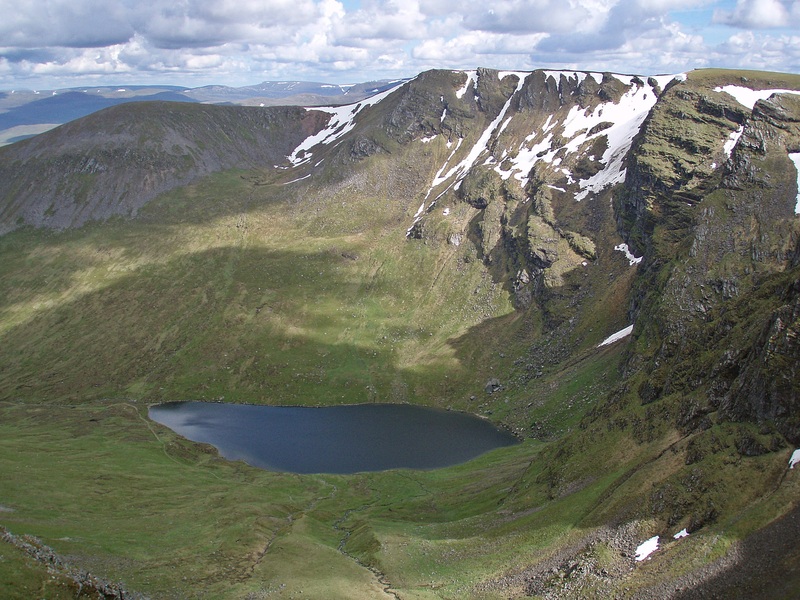 Sounds like a good choice – I was also thinking of including Creag Meagaidh in my TGOC 2015 route but decided on a much more northerly route in the end. Have a great time, and I’m looking forward to your Challenge trip report! 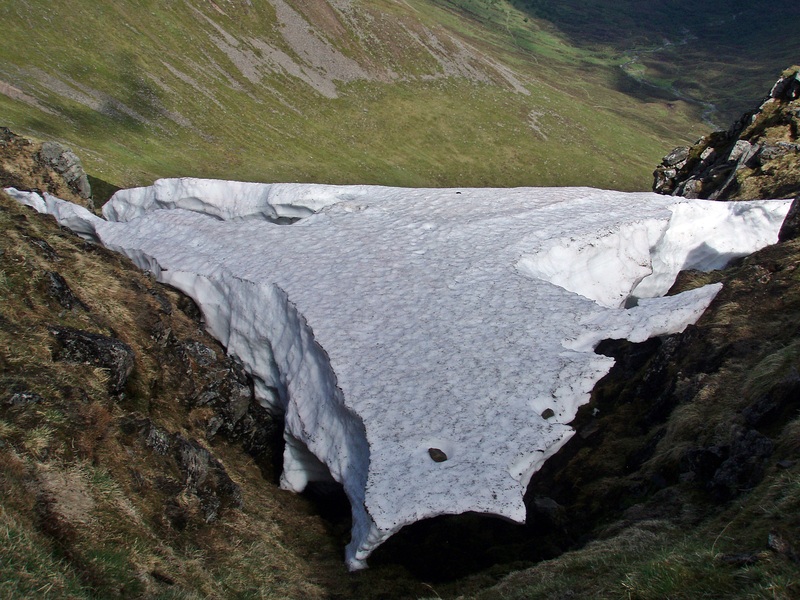 An elderly couple who I had met on the ridge between Stob Poite Coire Ardair and Carn Liath, had come up via The Window and mentioned that they had some difficulties on the snow-covered boulders, just as well it wasn’t on my route that day! 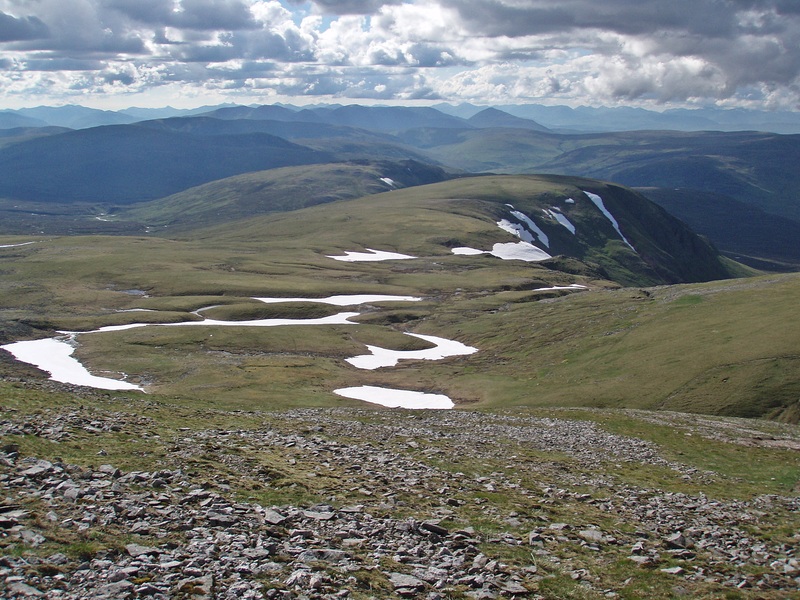 Your report also confirms that the descent path from Carn Liath is not easy to find from above, so I’m glad I used it in ascent instead. Some really good photos in your report as well! 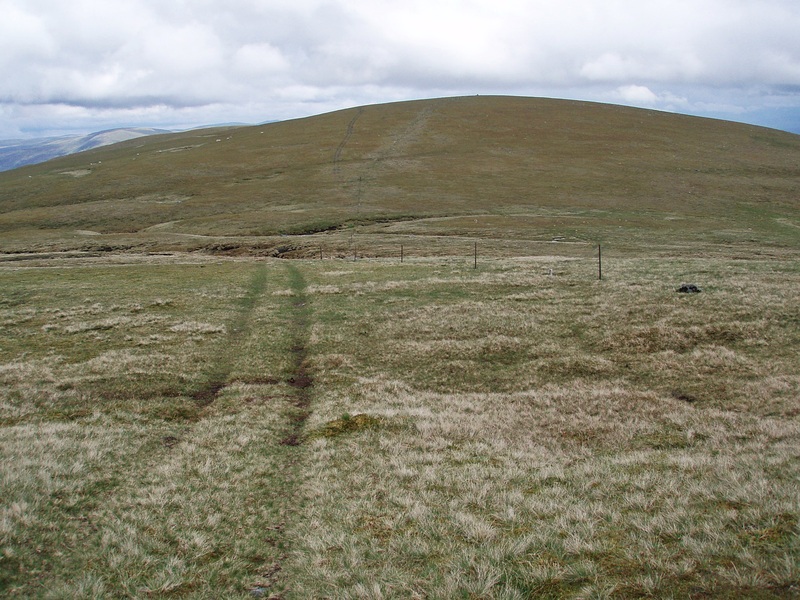 I was really surprised the Carn Liath path was so hard to find on the way down as I remembered it as a good path when we used it ascent – think my memory must be getting faulty!